Although she was quite angry with herself for needing 4 attempts to get that precious driver’s license, I kept reassuring her that it was not a bad performance at all. Her old man needed 3 attempts at a time – 35 years ago to be exact, when the testers were not so strict I am sure. Yes, this incident sure brings back some memories. I took my driving lessons from a driving school located at Niven Road, near to the former Rex Theatre, and opposite the Selegie Complex. Those days, we have the ‘pow chia’ or ‘guarantee pass’ system whereby you paid a fixed fee and they will keep training you until you passed your driving test. My instructor was a very nasty and hot-tempered fellow who drove like a demon. I often got verbally abused by him. As an engineering undergrad in the local university, being called stupid wasn’t exactly ego-boosting. Some more, when I finally passed, the guy had the gall to hint that I should give him a tip saying that his other students often gave up him a big ang pow. No way man! Not when I paid for the driving lessons and tests with my hard-earned money from giving maths tuition during my long vacation. Speaking of tuition, I am reminded of this very nice lady who engaged me to tuition her son in Additional Maths at their home in Tai Keng Gardens. We agreed that I had to stop when my university term started. But when her son’s exams approached, she persuaded me to give him some additional last minute coaching. For those few short sessions, she paid me a handsome figure which was much more than what we agreed on. 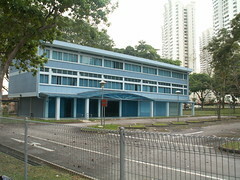 Most of my lessons were held in the vicinity of the Queenstown Driving Test Centre at Commonwealth Avenue, just next to the present Queenstown MRT station. But for my first lesson, my instructor brought me to a secluded spot near a graveyard along Kheam Hock Road. It was here that we practised how to do parking with the wooden poles as guide posts. This road off Kheam Hock Road is known as Lorong Halwa. It used to lead to a big empty area next to a cemetery. 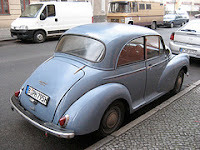 In those days, the car practically all the driving schools used was the trusted Morris Minor, the same one that my brother Chew bought for $600. One very interesting detail about his car that I remember is the indicator. It is actually made of ‘hands’ which flipped up from the side of the chassis every time you signalled left or right. This building which used to be the Queenstown Driving Test Centre looks deserted when I took a photo of it last Friday. A photo of the popular L-car, the Morris Minor, courtesy of Flickr member Schockwellenreiter. The theory test or Highway Code test should be quite interesting to my young readers. We actually had to manually move a toy car on a model of the streets to answer verbal questions put to us by the tester. Another interesting thing is that besides the date you have booked for your driving test, you can try to ballot for an additional date. After I failed my first test, I booked a date for a repeat immediately. But I managed to secure an additional, earlier date by this method. Unfortunately, I failed in that second attempt, but the date that I had book earlier was still reserved for me. For the practical test, the first item, if I recall correctly, was the parallel parking which was held within the test centre premises. Some people don’t even make it beyond this stage. Other major items being tested were reversing from major to minor road, three point turn, clutch control on a slope and emergency braking. The tester would hold a newspaper. And when he tapped it on the dashboard you are supposed to step on the brakes. I almost failed my last test because I did not react quickly enough. My excuse was that he had tapped his papers so gently, it was very difficult for me to sense the urgency. He gave me a second chance and this time I almost drove the brake pedal to the floor. 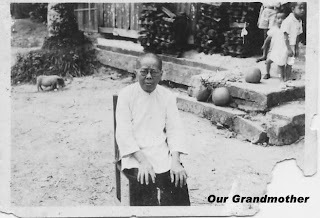 My beloved paternal grandmother came from Southern China, in the district of Nanhai （南海). She and my grandpa came to Singapore sometime in the early 1900s. The first thing they did was to buy a piece of land to settle down. 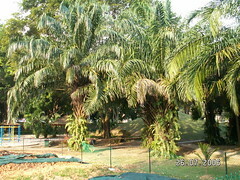 They took a liking to a plot of kampong land (2 acres) at the Lorong Chuan area, comprising 2 attap huts, 2 fishing ponds, 2 durian trees, 1 chiku tree, and many other trees. My grandpa named the place ‘Kwong Lam Yuen’ (Lam estate). Later on my grandpa died accidentally while fetching water from the well. He slipped and hit his head on the side of the well. I was my grandma's favourite grandson. One day, I asked her why she chose to settle down in a Hokkien area as we were the only Cantonese family in the whole kampong. In those days, the Chinese settlers were very clannish and liked to gather together in various dialect groupings. She replied that most Cantonese would like to stay in the nearby kampong of Pontong Pasir, famous for the cultivation of water-cress. The reason was that Hokkien and Teochew areas had better fengshui, and that was the reason why they were the most prosperous clans. She wanted to hinge on this advantage. In Lorong Chuan area, the soil was suitable for planting of chai sim and kai lan, and my best childhood pal, Chin Huat’s father was an expert farmer in these types of vegetables. My grandma was a happy-go-lucky type of lady. She would appear in our kampong house whenever it was time to harvest coconuts in our farm. The rest of the time was spent in her favourite daughter’s house somewhere in the present Moulmein Road area. After each harvest, the coconut harvesters would pay her between $60 to $80, which was a tidy sum of money at that time. Then enjoyment time would follow. The first thing she would do was to bring me a see a show at one of the big theatres like Capitol, Cathay or the newly opened Odeon (first film was the President Lady starring veteran actress, Susan Hayward). She did not mind the show being an English one, which she did not understand. Enjoying the air-conditioning, she would sleep throughout the show. One of the shows I liked best was ‘Scaramouche’, a sword-fighting film shown in the Capitol cinema. After each show she would bring me to a coffee-shop and there we would have a nice lunch, and Hainanese pork-chop curry rice was my favourite. All travelling was done by taxi, a luxury at that time, and I was the only grandchild able to enjoy this privilege. I could only return her love by kneeling in front of her and offering tea in the morning on the first day of every Chinese New Year and receiving an ang pow in return. As soon as I passed my driving, I bought a second-hand Morris Minor to drive her around, sending her for visits to relatives. Apparently this act made her very happy. Not long after I started working, she began to have problems with her legs and subsequently, stricken by poor health, she became bed-ridden. She passed away one night, and her last words were: “one cup of water”. I have this guilt-conscience of not doing enough for her for what she had done for me. She left behind an estate (later acquired by the government) for her children. As for cash she spent almost all, a part of it was on me. Our grandmother passed away when I was quite young. As such, I do not remember much about her except for 3 things. 1) She often had aches in the neck and shoulders and got us to do what in Cantonese is called ‘tub kwat’ – not exactly massage but gently pounding with with the base of our fists. Not sure what is exact term in English, but you often see this in Chinese movies. 2) She liked to eat melon seeds (kwa chi), but because her teeth were not strong enough, we helped her to pry open the melon seeds by knocking them with the handle of a pair of scissors. 3) She slept on the old fashion type of pillow which was very hard and resembled a block of brick. In fact you can still buy such pillows at the Chinatown Heritage Centre. In my earlier post about the A&W Restaurant in Dunearn Road, I put up a sketch of the vicinity. My friend Peter pointed out that there was a mistake in the sketch. 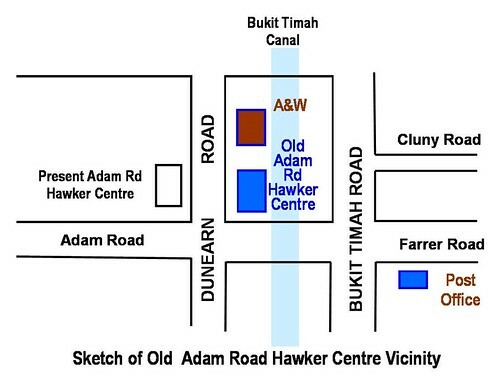 and that the old Adam Road Hawker Centre was on the same side as the present location. I checked with my friend Chuck and my younger brother James, and they both agreed with Peter. I began to have some doubts. That jolted my memory and so I want to 're-blog' about this place. 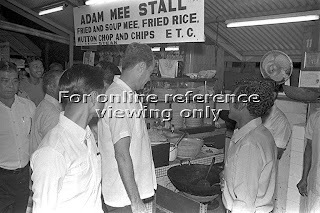 My first memories of the Adam Road Hawker Centre were in early 1971. (I think I probably learned of this place from my 2 years in nearby NJC in 69/70). Anyway, at that time I was doing my national service in SAFTI. When I booked out from camp on Saturday afternoons, I would occasionally stop over there for some nice, cool ice kacang. I probably had to change a bus there to return to my kampong home in Lorong Chuan. After 1 week of Safti cookhouse food, and losing buckets of sweat for “duty, honour, country”, the ice kacang of Adam Road Hawker Centre was heavenly. And I remember the place was beside the canal. I believe it was relocated to the other side of the road in 1974. I did a search in the picture archives of National Archives of Singapore and found several photos of Mr E. W. Barker, our former Law minister opening the ‘new’ food centre at the junction of Adam Road and Dunearn Road. The year was 1974. In the early 80’s an old friend of me and my brothers, Chuck Hio, often came to our house at Farrer Rd to play mahjong in the weekends. After midnight we used to adjourn to this Hawker Centre to enjoy a night snack, including Chuck’s favorite – tulang (cow bone marrow). He taught us the special technique of how to ‘knock’ the tulang out of the bone by holding it with the left hand, and gently banging the wrist with your right hand. At that time, we had a downstairs neighbour who operated a stall here selling fruit juices. 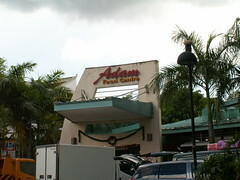 In 2001, it was closed temporarily for upgrading under the Hawker Centres Upgrading programme and was reopened in 2002. Since I am on this subject, I would like to add some additional information for the benefit of the young people. 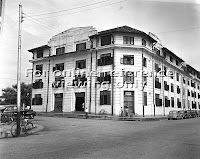 1) Did you know that the original flyover at this busy junction ran perpendicular to the present Adam Road flyover? 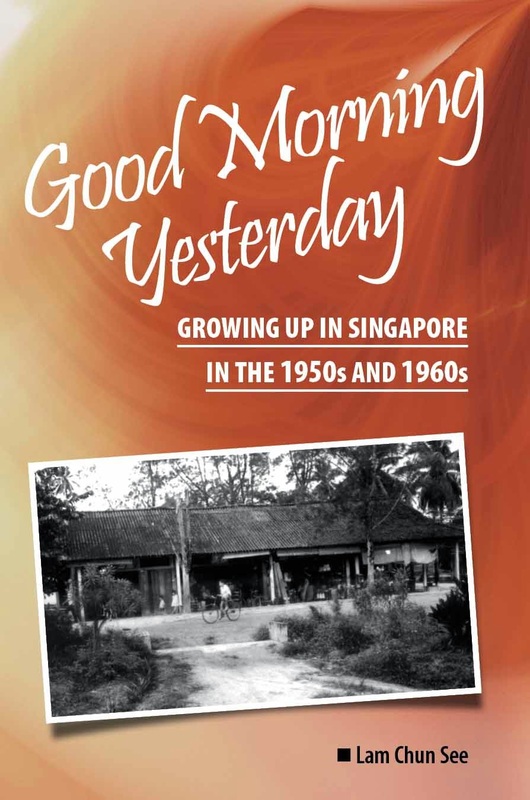 And this one I am very sure because after I moved out of our kampong, I stayed in Farrer Road for 12 years from 1974 to 1986. Initially the flyover was built to facilitate the flow of traffic along Dunean Road and Bukit Timah Road. Later this flyover was demolished (probably in the 90’s) and replaced by the present underpass. I drove past this place very frequently - and still do, and when I saw the demolition works, I thought to myself, what a waste to demolish such a new flyover. 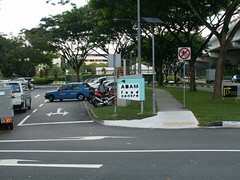 Subsequently, a new flyover was built joining Adam Road to Farrer Road. 2) Also did you know that Cluny Road used to run all the way from the entrance of the Botanic Gardens to Bukit Timah Road? Anyone who had driven here must remember the very sharp bend near the rear entrance of BG. 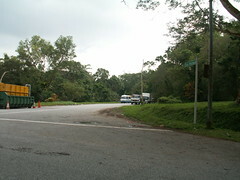 But recently, with the extension of BG to Bt Timah, Cluny Rd was truncated and so they renamed the Bt Timah section, Cluny Park Road, and joined it to Tyersall Avenue. 3) One last bit of information. 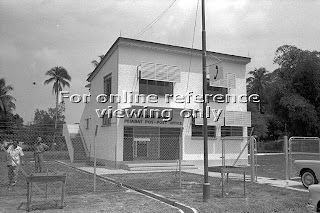 There used to be a Post Office just opposite the Serene Centre along Farrer Road. Next to it was a Mobil petrol station that I frequented. Both have been replaced by the Lutheran Towers. Incidentally, I think Lutheran Towers was originally built for the executives of HDB. 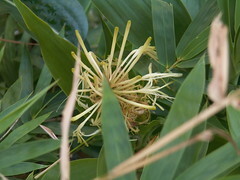 Just 2 weeks ago, I blogged about seeing the flowers of the Ribbon Plant or Lucky Bamboo (观音竹) in my garden for the first time. I checked the date of the photos and it turned out that it was 26 February 2006. Does that mean that our Ribbon Plant blooms every February? 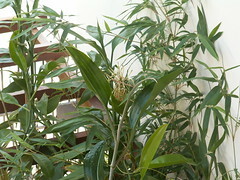 If the reader who commented that this blooming of the Ribbon Plant symbolizes good luck and prosperity (觀音竹開花,富貴榮華! ), then can I expect good fortune to come my way? Of course we do not believe that sort of stuff, but certainly, I am happy to see the flowers again and share more photos with you here. Here’s wishing everyone, Chinese and non-Chinese, a Blessed Chinese New Year. May the Lord grant you your heart’s desires. Chinese New Year is the favorite time of the year for kids of my time. 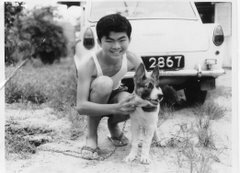 Since Chinese New Year is just around the corner, I think I will blog about the Chinese New Year of days gone by for the benefit of the young people. But I want to put a twist to it. I think it was Minister Mentor Lee Kuan Yew who said that the Chinese are incorrigible gamblers. I tend to agree with him. Even as primary school kids, we used to gamble during Chinese New Year using our ang pow (red packets) money. We would play card games like ‘sar ki’ (3 cards) or ‘ban-luck’ (black jack). This was very bad indeed. I am so glad that I have given up this bad habit totally for the past 20 years. Whenever I see people gambling during the Chinese New Year festive season, I am reminded of one scene at the temple near my house. There was this young lady who was so engrossed in her card game. She was squatting on the floor together with a group of other kampong folks and was perspiring profusely. Occasionally, she would reach for her handkerchief, which she has tucked under her samfoo blouse at the left shoulder, and wipe her sweat. It wasn’t a pleasant sight. At this point, I want to go on record to say that I am totally against the government’s building of casinos in Singapore. They may call it an ‘integrated resort’, but as one blogger said, A dung by any other name stinks. Like most of the village women folk, my mum was superstitious about Chinese New Year practices. As such, we were not allowed to sweep the floor with a broom during the first 2 days of Chinese New Year. It was supposed to sweep away the good luck or something. So we had to use a dry cloth to wipe away the dust. During our time, soft (aerated) drink was not something most folks could afford to consume everyday. Chinese New Year was one of the few occasions when we had practically free flow of soft drinks to the delight of the kids. My favorites were Sarsi and Ice Cream Soda. (Actually I just came back from dinner in the middle of writing this blog. Guess what I decided to order at the kopitiam to wash down my dinner …. a can of ice cream soda of course!) You might recall me writing earlier that my favorite soft drink was Pepsi Cola. But for Chinese New Year, we usually order the soft drinks by crates like those in this photo. 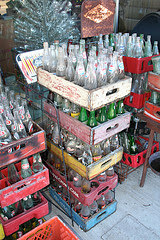 (Thanks to Flickr member The Rocketeer for this photo of glass soft drinks bottles). The famous brand then was Framroz, and hence there was no Pepsi for Chinese New Year. Those days, the drinks came in glass bottles. When the bottle cap is removed with a bottle opener, it made a ‘pop’ sound. I think that’s why the Hokkiens refer to soft drinks as ‘pok chui’. 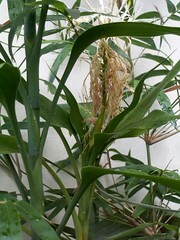 As to why the Cantonese called in ‘Hor Lan Sui’ or Holland water; I am still clueless. Of course today I do not miss soft drinks. Firstly they are so freely available. Secondly, they have too much sugar and not good for health. What I said about soft drinks applies to oily meats like roast chicken, roast ducks and roast pork. In those days, such meats were served only during festive occasions. Let me give you an illustration of how precious meat was. Sometimes, my mother made soup with big chunks of lean pork. After the soup was completed, she would ‘recycle’ the pork, which by this time did not have much taste, by slicing the pork into smaller pieces and frying it with various sauces, and thus create an additional dish. One traditional dish that our family always served during Chinese New Year was a vegetarian dish cooked with ‘lam yu’ (I am sorry I don’t know the name in English) and ‘fat choi’ (发菜); the black moss that was very much in the news recently because it was reported to contain some toxic substance which could cause Alzheimer’s disease. Everyone who came to our house liked this dish and my mother used to cook a huge pot. After my mother passed away, my sister took over this responsibility. 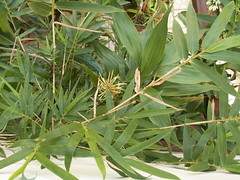 But I never participated because I hated the smell of the lam yu. This one does not actually belong to the list because it is the one thing I actually missed about Chinese New Year. Somehow, without the sound, and especially, the smell of fire crackers, Chinese New Year is not the same. I have always wanted my children to at least have one try at letting off fire crackers. And so, a couple of years ago, when a Malaysian friend invited us to their home for a Chinese New Year gathering, we, both adults and children, jumped on the opportunity to ‘let go’. We had a swell time that year in Pekan Nanas. But I must say that firing modern fire crackers is not as exciting as when we did it in the 50s and 60s. It’s not because I am now older or that I have been a demolition officer in the army for a number of years. It’s because today’s fire crackers are produced with better quality control. Hence, the burning rate of the fuse is very consistent. When lighting up a fire cracker during the old days, you never know if you might get one where the fuse burns up super fast. I cannot be sure of this as I am no longer a kid. But thinking back, somehow, I feel that kids growing up in the kampongs during the 50s and 60s enjoyed their Chinese New Years more than the kids of today in 21st century Singapore. 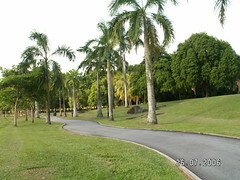 One of the favourite places that my exercise buddy Chun See and I like to go to for our brisk walking is Bishan Park. I envy the residents of Bishan for having two huge, beautiful parks at their doorsteps. The first one is bounded by Bishan Road and Marymount Road, and the second one between Marymount Road and Upper Thomson Road. On those days when Chun See has to fetch her daughter from the MOE Language Centre at Bishan St 14, we would use the park connectors joining Bishan Park to Potong Pasir. My personal favourite is the park next to Bishan Road. There is a small ‘farm’ inside the park where they (the nearby residents, I guess) have planted many types of vegetables, fruit trees and flowers. It reminds of my of my kampong. I use the opportunity to show off to my friend my knowledge of the names of the many different plants. I was very happy to see some palm trees near to this garden. 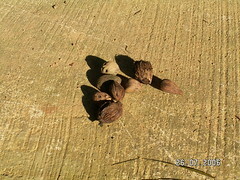 I saw many seeds on the footpath. When I was a kid growing up in our kampong at Hillview area, we used to collect these seeds. I showed some of them to my sister, and she too could recall, with fondness the ‘toy’ that we used to make with this type of palm seeds. Can you guess what toy it was? Answer …... Wedding Rings. We kids would pretend to get married and give each other these rings. Do you know how it is done? It is very simple actually. We simply take the seed and rub it repeatedly against a hard and rough surface such as the cement drain or floor until it becomes flat. Then we knock out the centre core and … voila, we have a cheap wedding ring. 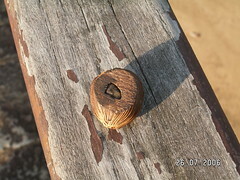 Out of fun, I actually made one from the seeds I found at Bishan Park and gave it to my wife. When my 11-year old son saw it, do you know what he said? If you agree with Herman Wouk who said that tragedy lies in waste**, then you will probably agree with me that Saturdays are ‘tragedays’. Every Saturday, waste arrives at my doorstep in the form of the Straits Times. And yesterday was particularly ‘tragic’. Right in the front page was this huge headline, Effects of Global Warming ‘unstoppable’. But what was more disturbing was the proud announcement that yesterday’s edition comprised a whopping 274 pages in 9 parts. I don’t know about other Singaporeans. For me, the 4 sections on Classified Ads and Recruitment usually go straight to our ‘garang guni’ (collector of old newspapers) pile. That’s a staggering 146 pages which weighed - I don’t know … half a kg perhaps. Each time this happens I would wonder how many trees have to chopped down simply so that I can sell more old newspapers to the garang guni man. With a daily circulation of 400,000 (source: Wikipedia), I suppose that would translate to quite a few tons of paper. And that’s only for Saturdays. For the rest of the week, there is also the Chinese paper 我报 as well as that useless supplement Urban on Thursdays. Lest my friend Victor starts to complain (he’s in complaining mood lately) that my posts are more and more about present day issues rather than nostalgia, I must quickly mention that this issue of global warming and environmental pollution raised in the Straits Times is something I have read about 40 years ago. The year was either 1967 or 1968. I cannot recall if The Price of Progress was the title of an essay that our English teacher asked us to write or if it was the title of a book I happened to read. But I can clearly remember some of the contents of that book. warned of the dire consequences of mankind’s unbridled exploitation of the natural resources and the callous destruction of the environment. Global warming was definitely one of the topics covered in this book. I also remember reading for the first time about a phenomenon known as Temperature Inversion which the author predicted could kill thousands if it occurred in a large city like New Delhi or San Francisco. Unfortunately, I don’t think many influential people took note of theis book and things have not improved during these past four decades. Let’s hope that, with all the awareness brought about by the report put up by The Intergovernmental Panel on Climate Change (IPCC), things will be different in the next 4 decades. Otherwise it would be a real tragedy for future generations. ** As usual I am deliberately being misleading here. The ‘waste’ that Herman Wouk wrote about is of a totally different type of course. Pardon this stupid question from one who does not really understand football. Why can't they add 2 more linesmen near the penalty box to assist the refree in his decisions? If a tennis match which often involves only 2 players and a couple of thousand spectators at most can have an umpire and countless linesmen, and in badminton they have one guy who job solely is to check the low service, why can't they just appoint 2 guys solely to check for fouls in the penalty box? If it is a problem of cost, then just have it in the finals. Just think of all the agonies and problems it can prevent. It is easy for the jounalists to criticize the Thai players for being unsporting and so on; but certainly it is possible to empathize with the sportsmen who train and fight so hard only to see victory slip away through someone else's human error. My blogo-friend, Frannxis has written a very short and yet meaning post in his blog. I fully agree with Frannxis’ outlook. As it had only a couple of paragraphs, I think he will not mind if I just reproduce the entire article here for the convenience of my readers. “Last week one new post65 MP said it was cool to be square. He was commenting on the PAP trying to be hip in order to connect with the younger generation. No need, he said, people support the PAP for what it is – serious and square. In our relationship with friends, I feel you don’t have to put on an act if you don’t like or enjoy it. Your friends should accept you as yourself. Frannxis’ article reminds me about something one wise commander in the SAF said to us newly commissioned 2nd lieutenants in the officers’ mess of Gillman Camp back in 1977. He boldly declared that you cannot be an officer if you don’t drink (liquor). Well I have news for you sir. I survived all the way until age 50 as an officer; albeit only a humble two-pip platoon commander. In fact, when I ROD’ed in 1978, my CO in 30 SCE tried to persuade me to sign on, saying the Combat Engineers needed more graduate officers. I was really proud to be acknowledged as ‘one of the better officers’ because I always knew that I didn’t have much leadership qualities in the conventional sense. Thank you, Captain Wilson Tay, for your kind words. 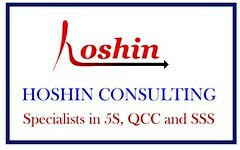 In the business world too, it is not uncommon to meet people who think that you must conform to stereotypes to survive. For example, you must have heard well-meaning people say that if you want to succeed in doing business in China, you must know how to ‘yen-jiu’ (烟 酒); i.e. smoke, drink and embrace other vices. I don’t have any personal experience to refute these people, but I am pretty sure they are as wrong as the wise officer in Gillman Camp. Be prepared, though, to be called names; as I was once. One Malaysian client called me ‘member of the soya bean brigade’ because I declined his offer of beer. Irony is; he was a Muslim.